Lincoln, Nebraska – Irving Middle School instructional coordinator Deanna Macek was presented with the R.L. 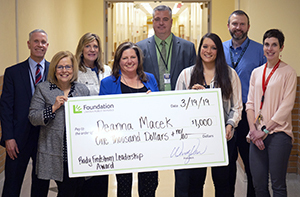 Fredstrom Leadership Award by the Foundation for Lincoln Public Schools on March 19, 2019 at a staff meeting with colleagues and her family. Macek was recognized for building positive working relationships, showing compassion and being an exceptional leader. She was nominated by her colleague, Rachael Kluck-Spann. The R.L Fredstrom Leadership Award was established to honor Rudy Fredstrom, a long-time Nebraska teacher and administrator who served as assistant superintendent of LPS from 1951-75. His mantra was “never quit learning.” This award recognizes LPS teachers or coordinators who show outstanding leadership qualities or demonstrate the potential to become an outstanding educational leader. Winners receive a certificate, an engraved clock and a monetary award to be used to continue their education and refine their skills in the area of serving education through leadership. Previous award winners include Nancy Bare of LPSDO and Prescott Elementary School, Carrie Erks of LPSDO and Randolph Elementary School, Cheryl Richter of Fredstrom Elementary, and Joseph Rousseau of the Expelled Program.